House of Jamie’s Spring collection is a diverse collection with strong new designs and vibrant colors. On the menu a variety of delights, Honey Mustard, Granite, Dusty Lilac and a beautiful floral print, smoothly blending in with the already established collection. The label also introduces her first swimsuit line. Designed with a gorgeous open back detail and all over ruffles, available in Powder Pink & Caramel Leopard. Made from fabric with the highest ultraviolet protection factor (UPF50+). 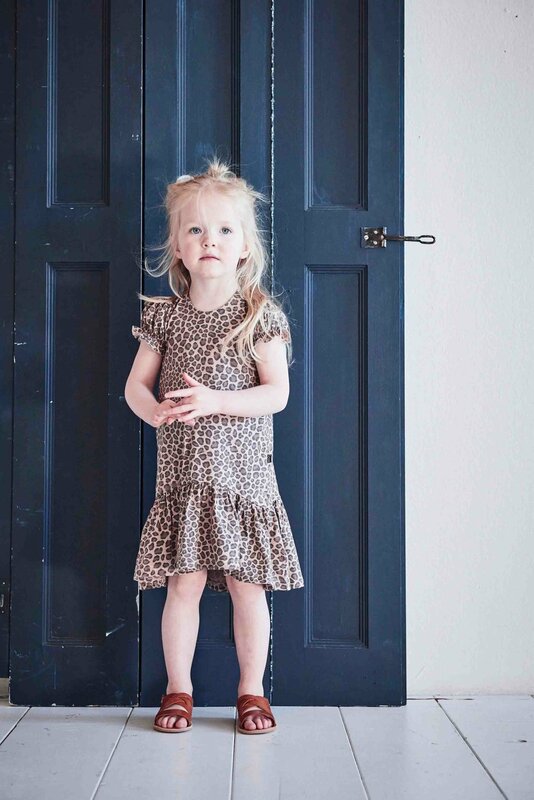 Three new dresses are designed for girls who like to wander around, including a Bodysuit Dress for the little ones. For the more playful moods a Ruffled Short is added together with new timeless ribbed pieces, executed with curled up cuffs for that Italian flair. New basic rib essentials for boys are also joining the collection; a Bodysuit, Short- and Long Sleeve Tee in the rustic color Granite. And nice to know, a renewed summer short with crossover details is also introduced. And finally here! Especially for the little bambini, a jumpsuit with long sleeves and legs for the chilly spring & summer days. Made from a single jersey and rib fabric.